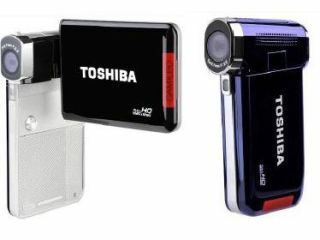 Toshiba has unveiled two new camcorders with the Camileo S30 and P20 offering lightweight, simple video recording. The Camileo S30 and P20 both take 1080p footage and high quality stills and offer easy YouTube uploads. They have a 3-inch touch-sensitive screen and 10x digital zoom with SD card compatibility. The S30 is 19mm thin and offers more advanced features which "provide excellent quality full HD performance, 8MP still photos, video stabilisation and a touch-sensitive menu system offering quality, reduced shake and ease-of-use." The P20 costs 20 quid less, offers 5MP still images and has a pocket-friendly pistol grip design. The Camelio S30 has a UK release date of January 2011 and will cost £139.99, and the P20 arrives in October 2010 and has a UK price of £119.99.